Today marks the 107th anniversary of the death of Queen Victoria. 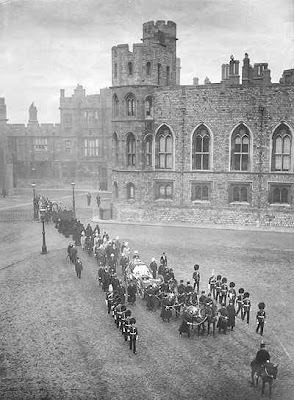 Shown above (click to enlarge): The queen's cortège on its way from the Albert Memorial Chapel at St George's Chapel, Windsor Castle, to the mausoleum at Frogmore House in the castle grounds (4 February 1901). Victoria is buried there next to Prince Albert. The procession was captured on film by Hepworth and Co. as it passed Marble Arch earlier in the day; to view the 30-second clip, visit the "Moving History" website. 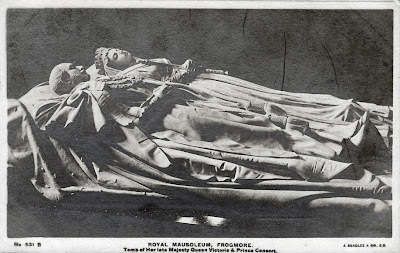 Shown below: Effigies of the queen and her consort on the tomb at Frogmore. That's a great pic of the funeral procession. I don't think I've seen that one before. If you can't get to Frogmore a great place to visit is the Vitoria and Albert Museum who have a cast copy.